Cobblers connection: One of Jake Robinson’s finest hours in a Shrewsbury shirt came against the Cobblers in a 3-1 win at the New Meadow in 2010. Robinson scored 13 goals in 40 starts for the Shrews before his release, after which he joined Northampton as part of Gary Johnson’s summer recruitment. Made a slow start to life at Sixfields but gradually came good before the arrival of Aidy Boothroyd, who never rated the forward and oversaw his exit from the club, initially to Luton and loan and then on a free transfer. Currently at Conference South side Whitehawk. Jefferson Lake’s preview: The Cobblers have nothing to lose and everything to gain in their weekend trip to second-placed Shrewsbury Town, a team who have not lost on their own ground and who have the controls firmly set on an instant return to Sky Bet League One. It will be a stern test, perhaps the ultimate test, of the recent form of Town, who recovered from the single-point haul from successive away games by getting back to winning ways at the expense of a poor York City side in their most recent outing. Chris Wilder has only one real choice to make for the game and it involved Ivan Toney; the 18-year-old came off the bench to score the third goal in the York win, his second strong cameo appearance on the bounce. That might strengthen his case to start at Shrewsbury but it may also mean he is more likely to be used as an impact player and one who can alter the dimension of the game plan. The current Northampton side perform best when they play against teams who like to keep the ball and pass it - the absence of wins at Hartlepool and Mansfield was largely because both of those teams play direct and waste no time in getting the ball forward. At Victoria Park and Field Mill, the Cobblers failed to get to grips with the midfield battle and were not able to play their natural attacking game, although they did build up a head of steam in the latter of those fixtures. But while Shrewsbury’s style may make Saturday’s game more of a pure football match, their quality and unbeaten home record means the hosts go into the game as clear favourites. 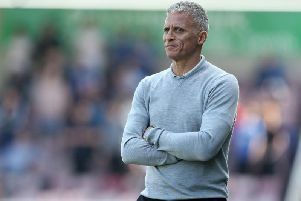 They made no secret of their spending power in the summer when they brought in Oldham’s player of the year Chris Wesolowksi and in-demand free agent James Collins, who was also on the radar at Sixfields as a potential number nine. The ability to recruit big hitters was again demonstrated in January when they splashed out a fee in the region of £100,000 for Peterborough United striker Tyrone Barnett, a player who will accompany Collins in Saturday’s forward line. Recruitment is, of course, only half of the battle and manager Micky Mellon, who was somewhat harshly sacked by Fleetwood despite taking them into the Football League, has again proved his Midas touch. He and Wilder were both shortlisted for the league two manager-of-the-month award in January; Wilder prevailed on that occasion but the true measure is always on the pitch and Saturday’s game looks set to be a good one.